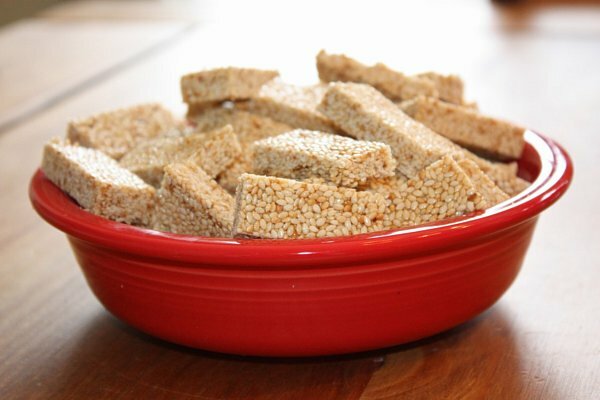 I grew up eating and loving Middle Eastern sesame candies. My grandparents would use them to pacify my sister and I when we were upset. I remember inhaling fistfuls of these candies they way most children would eat more American sweet treats like jelly beans or M&Ms. These were my favorite childhood candies and the honey and sesame flavor has always been one I've found comforting. It occurred to me that this flavor combination would be lovely in a cupcake. Not a simple honey cupcake, but one that truly infused the sesame flavor into the cake as well. I did some research, and saw recipes that utilized tahini (sesame paste), but this isn't really the direction I wanted to go in. Toasted sesame flavor actually has tons of sesame flavor in a small amount, so this seemed to me the best way to bring the sesame flavor into an otherwise honey-flavored cupcake. These cupcakes perfectly fit the flavor profile I wanted to achieve. Equally honey and sesame flavored, they reminded me of my beloved sesame candies. Toasted sesame seeds on top added a simple garnish. The frosting itself is an American buttercream, which is typically on the sweet side compared to some alternative frosting styles. This frosting is no exception, so if you have a sweet tooth this frosting is definitely for you. If you prefer less sweet for your frosting, cut back on the amount of frosting on each cupcake (I used a lighter hand myself when piping frosting on these, but alternatively spreading the frosting would definitely give you less frosting/sweetness per cupcake). I also would love to try making the frosting with some added cream cheese next time to add a bit of tanginess and softening up the sweetness. All in all, these cupcakes were a hit! From the cupcakes themselves (the batter was to DIE for) to the frosting, they were exactly what I was looking to make! Adjust the oven rack to the center of the oven and preheat to 350 degrees F. Line 18 standard muffin cups with paper liners (evenly distributed to prevent the pans from warping) and set aside. In the bowl of an electric mixer fitted with the paddle attachment, beat together the butter, sugar, and sesame oil until fluffy. Add the honey and beat again until combined. Add the eggs, one at a time, and beat until each is combined. Scrape down the batter in between additions (the mixture may look curdled, but it's fine). Add half of the dry ingredients, stirring just to combine, then the buttermilk, stirring again, and then finally the remaining dry ingredients. Stir until combined, but don't over mix. Use an ice cream scoop to distribute the batter among the liners, filling only about 2/3 full (don't over fill the ice cream scoop or the liners). You should have 18 cupcakes. Bake for about 18 minutes, or until a toothpick inserted into the center of the cupcakes comes out clean. Cool the cupcakes completely. Meanwhile, to make the frosting: in the bowl of an electric mixer fitted with the paddle attachment, beat the butter until fluffy. Add the confectioners' sugar about 1/2 cup at a time until well blended. Add the honey, toasted sesame oil, and salt and continue to beat until fluffy and smooth. If the frosting seems too soft to pipe onto the cupcakes (it may or may not depending on what room temperature is on that given day), place it in the refrigerator briefly for about 10 or 15 minutes (stirring it occasionally) until it gets just firm enough to pipe comfortably. Fill a pastry bag fitted with whatever large piping tip you prefer with the frosting and frost cupcakes (your method of frosting will determine how much frosting you use, if you prefer frosting-heavy cupcakes, you may want to multiply the amount of frosting you make by 1 1/2, but I think this frosting is on the sweeter side and should remain moderate in frosting to cupcake ratio). Sprinkle toasted sesame seeds over the top of each cupcake for a final garnish. Frosted cupcakes can be refrigerated up to 2 days in airtight containers; bring to room temperature before serving.